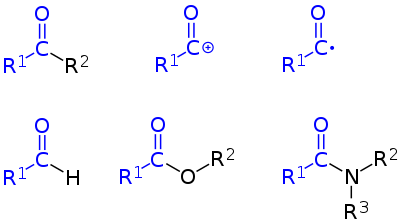 A general acyl group (blue) in a ketone (top left), as an acylium cation (top centre), as an acyl radical (top right), an aldehyde (bottom left), ester (bottom centre) or amide (bottom right). (R1, R2, R3 = organyl substituents or hydrogen). An acyl group is a moiety derived by the removal of one or more hydroxyl groups from an oxoacid, including inorganic acids. It contains a double bonded oxygen atom and an alkyl group. (R-C=O group is called Acyl Group) In organic chemistry, the acyl group (IUPAC name: alkanoyl) is usually derived from a carboxylic acid. Therefore, it has the formula RCO–, where R represents an alkyl group that is linked to the carbon atom of the group by a single bond. Although the term is almost always applied to organic compounds, acyl groups can in principle be derived from other types of acids such as sulfonic acids, phosphonic acids. In the most common arrangement, acyl groups are attached to a larger molecular fragment, in which case the carbon and oxygen atoms are linked by a double bond. Well-known acyl compounds are the acyl chlorides, such as acetyl chloride (CH3COCl) and benzoyl chloride (C6H5COCl). These compounds, which are treated as sources of acylium cations, are good reagents for attaching acyl groups to various substrates. Amides (RC(O)NR2) and esters (RC(O)OR′) are classes of acyl compounds, as are ketones (RC(O)R) and aldehydes (RC(O)H). The carbon–oxygen bond length in these cations is near 1.1 Ångströms, even shorter than that in carbon monoxide and indicative of triple bond character. The carbon centre of acylium ions generally have a linear geometry and sp atomic hybridization, and are best represented by a resonance structure bearing a formal positive charge on the oxygen (rather than carbon): [R–C≡O+]. They are characteristic fragments observed in EI-mass spectra of ketones. Acyl anions are almost always unstable—usually too unstable to be exploited synthetically. They readily dimerise to form enediols. Hence, synthetic chemists have developed various acyl anion synthetic equivalents, such as dithianes, as surrogates. However, as a partial exception, hindered dialkylformamides (e.g., HCONiPr2) can undergo deprotonation at low temperature (−78 °C) with lithium diisopropylamide as the base to form a carbamoyl anion stable at these temperatures. In biochemistry there are many instances of acyl groups, in all major categories of biochemical molecules. Acyl-CoAs are acyl derivatives formed via fatty acid metabolism. Acetyl-CoA, the most common derivative, serves as an acyl donor in many biosynthetic transformations. Such acyl compounds are thioesters. Names of acyl groups of amino acids are formed by the replacement of the ending -ine by the ending -yl. For example, the acyl group of glycine is glycyl, and of lysine is lysyl. Names of acyl groups of ribonucleoside monophosphates such as AMP (5′-adenylic acid), GMP (5′-guanylic acid), CMP (5′-cytidylic acid), and UMP (5′-uridylic acid) are adenylyl, guanylyl, cytidylyl, and uridylyl respectively. In phospholipids, the acyl group of phosphatidic acid is called phosphatidyl-. Finally, many saccharides are acylated. Acyl ligands are intermediates in many carbonylation reactions, which are important in some catalytic reactions. Metal acyls arise usually via insertion of carbon monoxide into metal–alkyl bonds. Metal acyls also arise from reactions involving acyl chlorides with low-valence metal complexes or by the reaction of organolithium compounds with metal carbonyls. Metal acyls are often described by two resonance structures, one of which emphasizes the basicity of the oxygen center. O-alkylation of metal acyls gives Fischer carbene complexes. The names of acyl groups are derived typically from the corresponding acid by substituting the acid ending -ic with the ending -yl as shown in the table below. Note that methyl, ethyl, propyl, butyl, etc. that end in -yl are not acyl but alkyl groups derived from alkanes. IUPAC nomenclature is recommended[by whom?] but rarely used. In acyloxy groups the acyl group is bonded to oxygen: R−C(=O)−O−R′ where R−C(=O) is the acyl group. Acylium ions are cations of the type R−C+=O ↔ R−C≡O+ and play an important role as intermediates in organic reactions for example the Hayashi rearrangement. ^ Chevrier, B.; Carpentier, J. M. Le; Weiss, R. (1972). "Synthesis of two crystalline species of the Friedel–Crafts intermediate antimony pentachloride-p-toluoyl chloride. Crystal structures of the donor–acceptor complex and of the ionic salt". J. Am. Chem. Soc. 94: 5718–5723. doi:10.1021/ja00771a031. ^ Smith, Michael B. (2013). March's Advanced Organic Chemistry. Hoboken, NJ: Wiley. p. 857. ISBN 978-0-470-46259-1. ^ Fraser, Robert R.; Hubert, Patrick R. (1974-01-01). "Direct Formation of the Carbonyl Anion of Diisopropyl Formamide". Canadian Journal of Chemistry. 52 (1): 185–187. doi:10.1139/v74-029. ISSN 0008-4042. ^ Elschenbroich, C. (2006). Organometallics. Weinheim: Wiley-VCH. ISBN 3-527-29390-6.